Bhanumathi Narasimhan has played a key role in The Art of Living Foundation, since its inception. Founded in 1981 by Sri Sri Ravi Shankar, The Art of Living Foundation is a non-proﬁt, educational and humanitarian NGO (Non-Governmental Organization) engaged in stress-management and service initiatives. The organization operates globally in 151 countries. 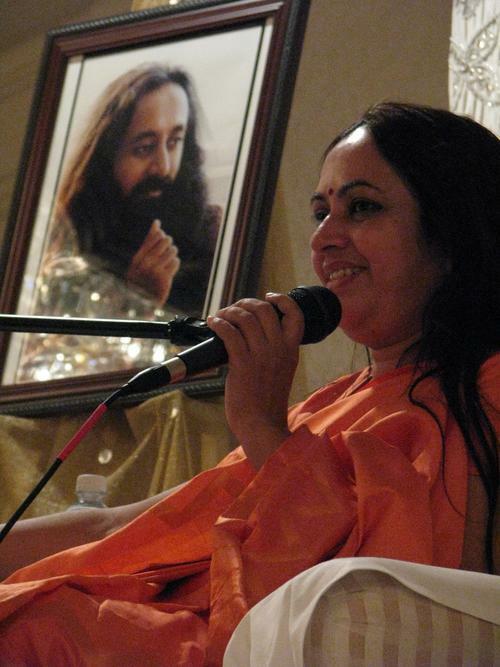 Sri Sri Ravi Shankar, her brother and guide, has been a constant source of support and direction for her. Bhanu has been instrumental in instituting the “Care for-Children” program, which provides education for underprivileged rural children, free of cost. The ﬁrst School to be supported by this program started in 1981 with 30 children in rural Bangalore. Now, 30 years later, there are there are 175 schools in 19 states of India educating over 24,500 children. She is especially focused on education for girls and empowerment of women.